The declaration on the 28th of June 2016 by Turkey of its sadness regarding the downing of a Russian fighter bomber over the Syrian-Turkish border on the 24th of November 2015 will no doubt have been greeted with relief both in Moscow and Ankara. 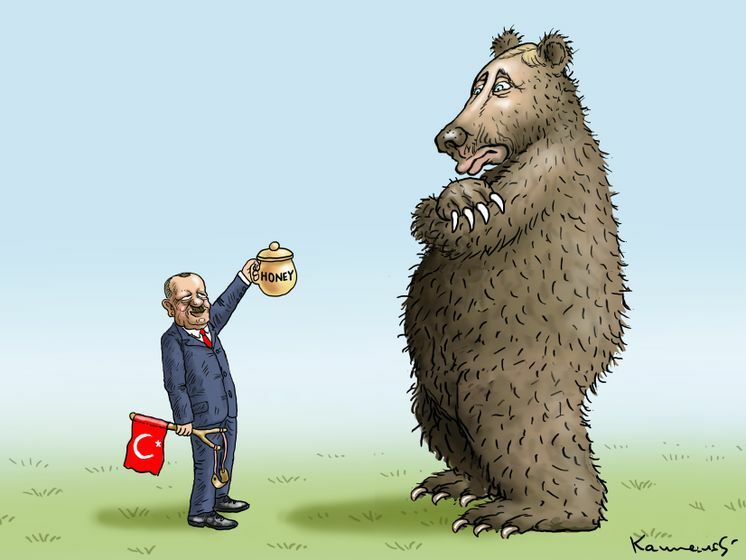 However, cynics might point out that this reheating of the Turkey-Russia axis might not be to everyone’s liking, especially Europe and the Kurdish minorities. Antoine Lavoisier’s principle of conservation of mass along the lines of “nothing is created, nothing is lost, everything is transformed” might mean a relative cold patch between the EU and Turkey now that uncle Vladimir is back in the picture. Indeed, Turkey has concluded an important treaty with the EU with regards to border and immigration control – many in Europe feared that Turkey had been given too much power of the EU’s external frontiers. That sentiment will only have been exacerbated by the recent events – Turkey had been in a relatively weak position on the international front and had been accused of using the Syrian conflict to launch targeted campaigns against the Kurdish militias fighting the Islamic State. With Russia (and to a lesser degree Israel) back on speaking terms with Ankara, the Turkish geopolitical influence is suddenly much more potent. On the other hand, this new entente with Russia could not have occurred at a worst moment for the EU, as it prepares to discuss NATO strategies in the upcoming Warsaw summit later this summer, and still reeling from the turmoil of the Brexit vote. From a Russian point of view, having Turkey as an ally once more is very good news for several reasons: in its most basic form, fighter jets will hopefully suffer no more attacks. However, on a more tactical front, Turkey represents a useful counter-ally for Russia against both the Syrian regime and Iran. In the case of the former, Russia will be able to ply more pressure on the Assad regime to comply to its vision of a future Syrian government, if it knows that turkey is on board. In the latter’s case, Russia will also be able to take up the “big brother” mantle once more as its own international and regional isolation will have come to an end. Moreover, by renewing vows of friendship with Turkey, Russia can also have its say on the Kurdish issue, making sure that pipeline projects that could compete with Russian infrastructures, be kept under close watch and control. Similarly, an alliance with Turkey can give Russia the edge when it comes to discussing Syria’s future with iran – bluntly put, Russia will be able to call upon Turkish interests in Syria to curb the Iranian influence in the country. Tel-Aviv as the Kurdish savior? From a Kurdish point of view, the recent tentative reconciliation between Ankara and Moscow might translate into Russia turning a blind eye to more targeted assaults on Kurdish militias. However, for those Kurdish forces currently waging a war on Daesh (and covert operations against Turkish armed forces), there could be a saving force materializing in the shape of Israel. Indeed, it is no secret that Israel has maintained close relations with various Kurdish groups for strategic reasons (against Syria, Daesh and Iran). The fact that Turkey and Israel has also announced a thawing of relations might just be the saving factor for the Kurdish interests in the region. Let’s face it – the EU is momentarily on the ropes: whether it be the ongoing Ukrainian crisis, the Brexit, the migration crisis to name but a few, Europe is looking temporarily weak at the moment. However, Europe must not forget its own strengths (essentially economic and in terms of “moral values”) and should therefore rejoice publically at the lessening of tensions between Turkey, Israel and Russia, whilst at the same time signifying that it is wary of any attempt to destabilize the region further or indeed find a solution to the Syrian crisis without including Brussels. Furthermore, an official visit or two to both Greece and Iran would not do any harm in terms of showing Europe’s willingness to flex its muscles and stand up to regional powers.